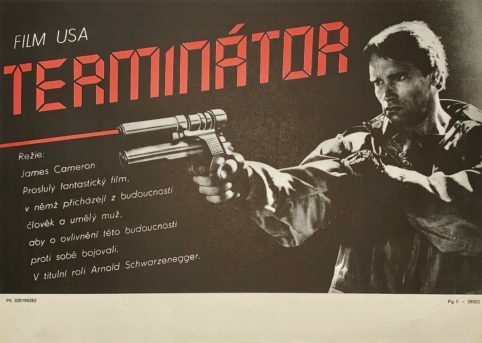 Extremely rare, “The Terminator” original Czech Flyer (horizontal) movie poster from first year of release in Czechoslovakia 1990. 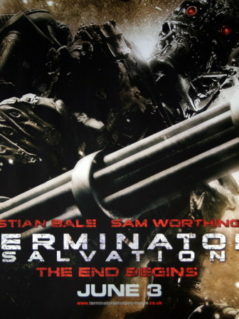 Featuring Terminator Arnold Schwarzenegger wielding his laser sighted handgun from the famous ‘Tech Noir’ disco scene. Originally flat/unfolded this displays to excellent effect and would make for a fantastic addition to any collection or as a one-off display piece. 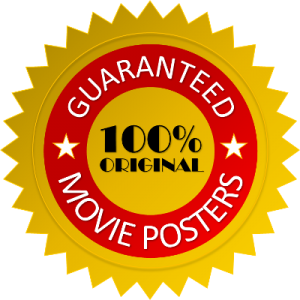 Truly impressive eye catching design and a fine piece of country unique artwork that represents highly collectible movie poster memorabilia for one of cinema’s greatest movies of all time and a pop culture phenomenon that blasted then new comer’s Arnold Schwarzenegger‘s career into orbit and made James Cameron a Hollywood name. 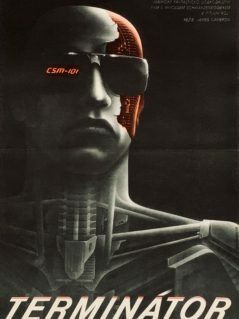 Trivia: Shots through the Terminator’s vision shows a dump of the ROM assembler code for the Apple II operating system. If you own an Apple II, enter at the basic prompt: ] call -151 * p This will give you the terminator view. Other code visible is written in COBOL. “The Terminator” is one of those films that no matter if you’ve seen it or not, you’ve heard of it, heck you know at least one or two lines without seeing it ! This is the movie that blasted then new comer’s Arnold Schwarzenegger‘s career, made James Cameron a name in Hollywood, and gave new meaning to a possible dark future that gave us nightmares. I remember the first time I saw this movie, this wasn’t just an action movie, though it is one of the best, it had a story. To think this was all based upon just a quick nightmare that James Cameron had, he didn’t have much money, but he had a good script, a great crew on his side to make one of cinema’s greatest movies of all time. Trivia: In the film, the name of the night club where the Terminator first targets Sarah was named Tech Noir after a film genre which James Cameron coined himself in describing what category this film falls under after dismissing the notions that it was a mere horror or slasher film. Tech Noir films like Blade Runner (1982) and this film combine the old style grittiness of noir films with the futuristic elements of a sci-fi thriller. Cameron himself had the club built specifically for the film and had to turn away local club goers who thought Tech Noir was a real night club. The building still exists but is now a jewelry store.